In this March 6, 2018 photo, a sign advertises the pending sale of a home in San Jose, Calif. The report on Monday from the National Association of Realtors (NAR) added to last week’s soft home building data in suggesting that the housing market lagged an apparent acceleration in economic growth in the second quarter. Existing home sales slipped 0.6 per cent to a seasonally adjusted annual rate of 5.38 million units last month, the NAR said. May’s sales pace was revised down to 5.41 million units from the previously reported 5.43 million units. 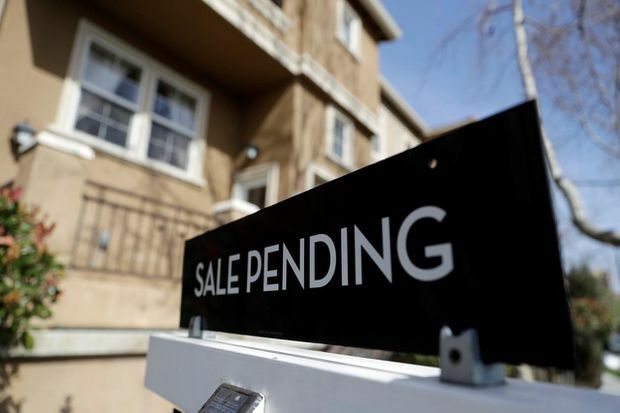 Economists polled by Reuters had forecast existing home sales gaining 0.5 per cent in June. Sales rose in the Northeast and Midwest. They fell in the West, which has seen a sharp rise in prices, and the South, where most of the homes are sold. Existing home sales, which make up about 90 per cent of U.S. home sales, dropped 2.2 per cent from a year ago in June. They have declined on a year-over-year basis for four consecutive months and decreased 2.2 per cent in the first half of 2018. Sales are being stymied by an acute shortages of homes on the market. Rising building materials costs as well as shortages of land and labour have left builders unable to bridge the inventory gap, pushing up house prices. The median house price increased 5.2 per cent from a year ago to an all-time high of $276,900 in June. That was the 76th consecutive month of year-on-year price gains. The 30-year mortgage rate is around 4.52 per cent, according to data from mortgage finance agency Freddie Mac. In contrast, annual wage growth has been stuck below 3 per cent. The PHLX housing index declined, underperforming a broadly flat stock market. Prices for U.S. Treasuries were trading lower, while the dollar rose against a basket of currencies. Growth estimates for the April-June period are as high as a 5.2 per cent annualized pace. The economy grew at a 2.0 per cent rate in the first quarter, with residential investment contracting. The government will publish its snapshot of second-quarter GDP growth on Friday. Housing supply is especially tight at the lower end of the market, with sales dropping 18 per cent in June from a year ago. There were 1.95 million previously owned homes on the market in June, up 0.5 per cent from a year ago. That was the first year-on-year increase since June 2015, but supply remains very tight. At June’s sales pace, it would take 4.3 months to exhaust the current inventory, up from 4.1 months in May. The Commerce Department reported last week that housing starts tumbled 12.3 per cent to a rate of 1.173 million units in June, the lowest level in nine months, and well below the 1.5 million to 1.6 million units per month range that realtors estimate is needed to alleviate the shortage. Houses for sale typically stayed on the market for 26 days in June, unchanged from the last three months and down from 28 days a year ago. Fifty-eight per cent of homes sold in June were on the market for less than a month. The share of first-time buyers was unchanged at 31 per cent last month.